Lefse (Norwegian pronunciation: [ˈlɛfsə]) is a traditional soft Norwegian flatbread. It is made with potatoes, flour, butter, and milk or cream. It is cooked on a large, flat griddle. Special tools are used to prepare lefse, including long wooden turning sticks and special rolling pins with deep grooves. There are many ways of flavoring lefse. The most common is adding butter to the lefse and rolling it up. In Norway, this is known as "lefse-klenning". Other options include adding cinnamon and/or sugar, or spreading jelly, lingonberries or gomme on it. Scandinavian-American variations include rolling it with a thin layer of peanut butter and sugar, with butter and white or brown sugar, with butter and corn syrup, or with ham and eggs. Also eaten with beef and other savory items like Ribberull and mustard, it is comparable to a tortilla. Lefse is a traditional accompaniment to lutefisk, and the fish is often rolled up in the lefse. Tynnlefse (thin lefse) is a variation made in central Norway. Tynnlefse is rolled up with butter, sugar and cinnamon (or with butter and brown sugar). Potetlefse (potato lefse) is similar to and used as tynnlefse, but made with potatoes. Potetkake or Lompe being the "smaller-cousin" of the potato lefse, is often used in place of a hot-dog bun and can be used to roll up sausages. This is also known as pølse med lompe in Norway. Nordlandslefse is a chunky small lefse. Made of butter, syrup, sugar, eggs and flour. Originally created in western Norway as a treat to fishermen who were on the Lofoten Fishery. Anislefse is made on the coast of Hordaland. It resembles thin lefse but is slightly thicker, and it is stained by large amounts of whole aniseed. Another variety, the Hardangerlefse (from Hardanger in Norway), is made from yeast-risen Graham flour or a fine ground whole wheat flour (krotekake). Additionally, it is often made with egg yolks and buttermilk instead of potatoes. The dough is rolled with a conventional rolling pin (and much more flour) until it is thin and does not stick to the surface. It is then cut with a grooved rolling pin in perpendicular directions, cutting a grid into the dough which prevents it from creating air pockets as it cooks. The grid cut can also aid in thinner rolling of the lefse, as the ridges help preserve structural integrity. The lefse is cooked at high temperature (400 °F or 205 °C) until browned, and then left to dry. It can also be freeze dried by repeatedly freezing and thawing. The wet lefse is dipped in water, and then placed within a towel which has also been dipped in water and wrung out. Many people maintain that dipping in salted or seawater enhances the flavor. The dry lefse regains its bread-like texture in about 60 minutes. Often that time is used to prepare such ingredients as eggs or herring which are wrapped in the lefse once it has softened. Lefse is a Scandinavian treat that is especially popular around the Christmas holidays. Many Scandinavian-Americans eat lefse primarily around Thanksgiving and Christmas. While the Midwest generally always makes its lefse with potatoes, this is not necessarily the case in Norway. When one uses the term “lefse” in the United States, it more than often refers to what Norwegians call potato lefse. Norwegians, however, also make Hardanger lefse with egg yolks and buttermilk. The tradition of making lefse was brought over by Norwegian Americans, and potato lefse itself was made when their potato crop was successful. Due to this, it became more prevalently made than other types in the United States. When lefse was able to be made, it was stored in small storage buildings called bryggehaus. When Norwegian immigrants first arrived in America, they did not have the usual foods they were used to back home, including milk and porridge, dried meat, and lefse, but early Norwegian-American immigrants brought folded lefse to eat for the beginning stages of their immigration journey via ship. After these were eaten, the lack of food they were used to is likely why they turned back to tradition so quickly. During World War I, Americans were encouraged to eat potatoes to be patriotic, as the front lines needed the wheat grown at home. Lefse, a staple for Norwegian Americans, was eaten with gusto during this time. While lefse is generally not eaten with day-to-day meals in Norway today, Norwegian Americans traditionally give prominence to having lefse with their supper, considering it their specialty. Furthermore, that some Norwegian Americans still make lefse has been considered by some ethnic Norwegians to be unstylish, as it has fallen so out of tradition to hand-make the dish. Family members often gather to cook lefse as a group effort because the process is more enjoyable as a traditional holiday activity. This gathering also provides training to younger generations keeping the tradition alive. As the skills and patience to make lefse have been passed down less into the modern generation, the rounds have gotten thicker and smaller, whereas an ideal lefse is thin and large. The Sons of Norway have lodges to teach making lefse to younger generations. One of these lodges, in Vancouver, Washington, uses up to sixty pounds of potatoes to make lefse every month. While Lefse used to be eaten as a snack food, it is now more often made in large quantities for such lutefisk dinners. Some professional lefse makers can roll eighty-five to 100 lefse per hour, or even up to 140. In Norway today, most families tend to purchase their lefse rather than making it. While today’s Norwegian Americans consider making lefse at Christmas a tradition, more families are turning to purchase it from the store instead. For example, around $80,000 worth of lefse is generally sold around Christmas from Ingebretsen’s Scandinavian Gifts in Minneapolis, Minnesota, yearly. Lefse can also be found in many grocery stores around Midwestern states, including Minnesota, North Dakota, South Dakota, Iowa, Wisconsin, Oregon, Alaska and Washington. Norsland Lefse, a factory in Rushford, Minnesota, produces about a half million rounds of lefse each year. The foodway of Scandinavian lefse stretches from the Midwest all the way through northeastern Montana. Small lefse factories dot the landscape throughout this area, mostly in Norwegian communities. In the larger of these communities, Lefse can be found in grocery stores year round. In the Red River Valley specifically, “restaurants, supermarkets, and clubs all serve fish, lefse, and other specialties.” Additionally, many United States Scandinavian festivals have booths to sell lefse, and lefse can also be ordered directly from online. The town of Starbuck, Minnesota, is the home of the world's largest lefse. It was made in July 1983. Lefse is celebrated in cities and towns with large Scandinavian populations. Fargo, North Dakota, hosts the popular Lutefisk and Lefse Festival in August each year. Fosston, Minnesota, invites area lefse makers to compete for the title of Champion Lefse Maker at its Lefse Fest in November. In Mankato, Minnesota, Minnesotans of Scandinavian descent celebrate lefse day, a day for cooking lefse, on the Sunday after Thanksgiving. The Potato Days festival has been taking place in Barnesville, Minnesota, since the early 1930s; this festival also takes part in the National Lefse Cookoff. Sometimes Norwegian foods are integrated into other ethnic foodways. For example, one may use lefse in order to make enchiladas, rather than tortillas. Additionally, American lefse is sometimes served with butter, cinnamon sugar, brown sugar, or lingonberry jelly before being rolled, to be eaten in a similar fashion to a crêpe. One may also choose eggs, sausage, and cheese to make it into a breakfast burrito. One may also roll Smørrebrød into their lefse. ^ Zanger, Mark (2001). The American Ethnic Cookbook for Students. ABC-CLIO. ^ Dregni, Eric (2011). Vikings in the Attic: In Search of Nordic America. Minnesota: Minnesota University Press. ^ Prichep, Deena. "For Norwegian-Americans, Christmas Cheer Is Wrapped Up In Lefse". Npr.org. Npr.org. Retrieved 8 November 2017. ^ Blegen, Theodore (1940). Norwegian Migration to America: The American Transition. Haskell House. p. 188. ^ Blegen, Theodore (1940). Norwegian Migration to America: The American Transition. Haskell House. p. 8. ^ Dregni, Eric (2011). Vikings in the Attic: In Search of Nordic America. Minnesota: University of Minnesota Press. ^ Dregni, Eric (2011). Vikings in the Attic: In Search of Nordic America. Minnesota: University of Minnesota Press. p. 17. ^ Pilcher, Jeffrey (2017). The Oxford Handbook of Food History. Oxford: Oxford University Press. p. 437. ^ Vinje, Judith. "Lefse: Norwegian America's holy bread". The Norwegian American. The Norwegian American. Retrieved 26 October 2017. ^ Herzog, Karen (2008-11-30). "Labor of lefse keeps tradition rolling". Milwaukee Journal Sentinel. Retrieved 25 October 2017. ^ Dregni, Eric (2011). Vikings in the Attic: In Search of Nordic America. Minnesota: Minnesota University Press. p. 249. ^ Madar, Gregory (1996). "An Examination of Selected Ethnic Foodways in the Upper Midwest". Theses and Dissertations of South Dakota State University: 37, 46. ^ Dregni, Eric (2011). Vikings in the Attic: In Search of Nordic America. Minnesota: Minnesota University Press. p. 250. ^ Brown, Kay; Mussell, Linda (1984). Ethnic and Regional Foodways in the United States: The Performance of Group Identity. Tennessee: University of Tennessee Press. p. 56. ^ Madar, Gregory (1996). "An Examination of Selected Ethnic Foodways in the Upper Midwest". Theses and Dissertations of South Dakota State University: 49. ^ Deptolla, Carol. "At Nordic bar Valhalla, aquavit and lefse". Milwaukee Journal Sentinel. Retrieved 26 October 2017. 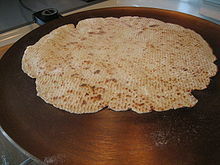 Wikimedia Commons has media related to Lefse.